A wall calendar with original quilt designs by Piecemakers on every page as well as scriptures and whimsical color drawings by Marjorie Serr. 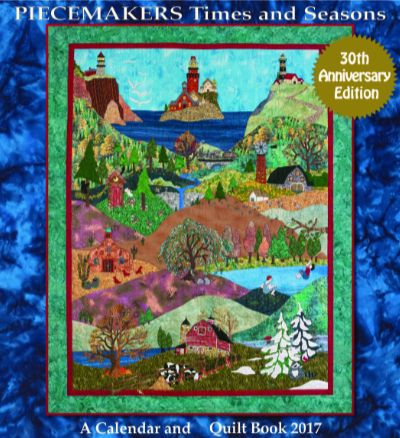 This anniversary edition of our Times and Seasons Calendar entitled "This Land is Your Land", celebrates 30 years of Piecemakers' calendar quilt designs. We chose blocks from some of our favorite years and combined them to create a whole new land full of wonder and promise, full of hope for our next generations that we never forget how truly blessed we are. A complete pattern book with instructions for applique, embroidery and beading to make the quilt is included. Calendar size, opened: 10.5" x 23". Cover quilt size: 52" x 70". PHOTO TRANSFER TRAIN IS NOT INCLUDED IN PATTERN. If you would like to order the train on fabric ready to applique, CLICK HERE. OR, CLICK HERE to download PDF file for the train that you can print on your own inkjet fabric sheet. 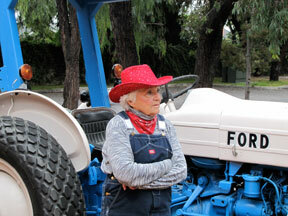 The PDF file is free to download from our web site.